News Release — April 2, 2018, LOGAN, UTAH — On your next stroll through the woods, take a look at the dew droplets hanging from the leaves. 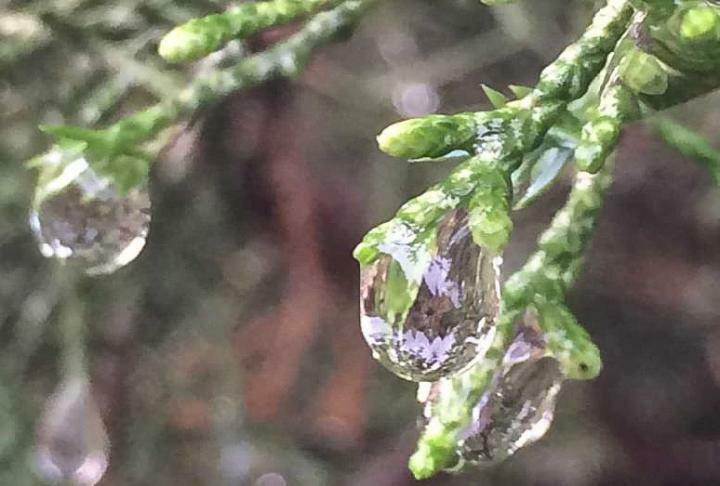 If you see moisture on a cypress or juniper tree with their distinct bifurcated leaves, you'll likely see those water droplets defying the rules of physics. Inspired by the large droplets that form on a leaf tip or other thin filament, a team of researchers from Utah State University, University of Liège, Belgium, and Brigham Young University have found the exact angle at which a bent fiber holds the most fluid. Their findings were published March 15 in the Royal Society of Chemistry's Soft Matter, a top journal covering physics, chemistry and biology. Lead researcher Dr. Tadd Truscott, creator of the world-renowned Splash Lab at USU, says the study offers important insight into the field of fluid dynamics. "For the first time, we can identify the exact angle of a bent fiber that will hold the most fluid," he said. "This research has many industrial applications including drug manufacturing or in developing technologies that use microfluidics. This could also be useful in developing more efficient fog-collection nets which are becoming more popular in arid regions. Or on the other hand, this research could inspire a more efficient dehumidifier design." Truscott uses the analogy of a spider web to illustrate the bent fiber concept. Water droplets attach to the web fibers at various locations, but the largest drops accumulate at the intersections of fibers that form acute angles. The best angle for a large droplet: 36 degrees. "After experimental testing, we determined that a bent fiber forming a 36-degree angle traps the most water," Truscott added. "That amount is three times more than can be suspended on a horizontal fiber." The researchers, including USU's Dr. Zhao Pan, Dr. Floriane Weyer and Dr. Nicolas Vandewalle of the University of Liège and Dr. William Pitt of BYU, tested their bent-fiber theory using a specially-constructed apparatus. Drs. Weyer and Pan built a rigid circular frame and strung nylon fibers from one side of the frame to the other. Next they attached a narrower fiber at the center and pulled the original horizontal fiber upward, forming an upside-down v. By varying the fiber attachment locations, they could change the angle formed between the two halves of the bent fiber. Liquids were applied to the fiber corner using a micro-pipette. The volume of the droplet increased incrementally until the droplet detached from the fiber. Truscott and his colleagues at the Splash Lab used high-speed photography to capture the entire process. The footage and other details were then analyzed and mathematically modeled by USU's Zhao Pan with the help of William Pitt at BYU. The researchers, of course, are not the first to be inspired by droplets in nature. The ancient poet Tu Fu (AD 712 – 770) recorded his observation of "heavy dew beads and trickles." Jules Renard penned a similar observation about 125 years ago: "A few dew drops on a spider web and here is a diamond river." Truscott says the droplet study offers a connection between science and art. "That's the best part of our lab," he said. "We are science nerds from different cultures, but we are all passionate about literature and art."